Historically, industrial robots have had to be separated from people by safety cages, programmed only by highly skilled application engineers, and viable for just a handful of precise and high volume applications. Industrial robotics typically require hundreds of hours of development and cost more than several £100k upwards and can rarely be repurposed or relocated without significant reengineering. 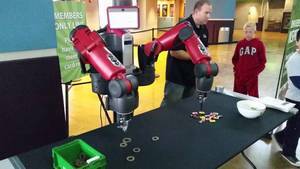 Collaborative robots on the other hand can be used for a variety of tasks considered impractical to automate with conventional robots. 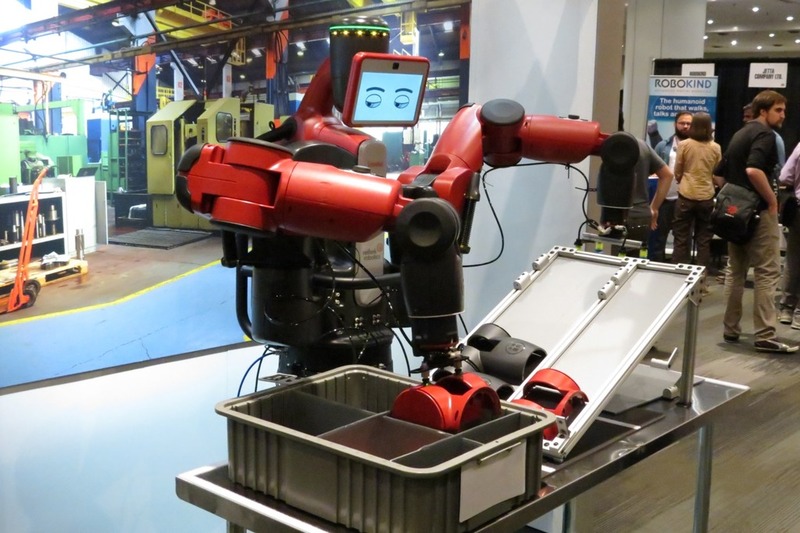 A smart collaborative robot, or cobot, modifies its behaviour to respond to changing or unexpected conditions in the factory floor using advance integrated features such as vision and force feedback. Cobots are much simpler to train, modify and deploy with the workforce, into the existing environment. When Rethink Robotics first introduced Baxter as a cage-free robot in 2012, the company got a lot of concerned looks from people who were accustomed to the idea of robots as rigid and dangerous machines. People needed persudaing that collaborative robots were safe to demonstrate without traditional safety guarding around it. The safety approach taken with Rethink’s collaborative robots centres around the combination of compliant arms, series elastic actuators, sensors and force control technologies. The aim is to routinely automate and streamline repetitive manual processes, often freeing up staff members to do more rewarding and enjoyable tasks, while adding significant value. The Sawyer robot is the latest in smart, collaborative technology enabling low cost, flexible automation for manufacturers. It is designed for machine tending, circuit board testing and other precise tasks which other robots are not suited for. Sawyer also provides the same safety features, flexibility, ease of training and user experience that users have experienced with the older Baxter robot. Sawyer can work side-by-side with human co-workers in a smaller space. With a seven-degrees-of-freedom arm and an impressive 1260mm reach, Sawyer can manoeuvre into the tightest of spaces. Sawyer features a new embedded vision system, with a head camera for wide view applications and a Cognex camera in its wrist that can support many complex vision tasks. Intera 5 is a brand new software platform that connects everything from a single robot controller, extending the smart, flexible power of Sawyer to the entire workcell. Intera 5 supports connected advanced manufacturing environments and fundamentally changes the need for integration, making it substantially easier and more affordable, allowing manufacturers to deploy full work cell automation in a matter of hours, not weeks. • Embedded vision, which will allow the robot to perform tasks just as humans do, reducing the need for expensive part presentation fixturing and additional integration costs. • Adaptive force-sensing, allowing users to precisely set the amount of force required, or enable the robot to feel and respond to a specific force, so the robot can make adaptive decisions while performing a task. Active8 Robots is the UK & European distributor for Rethink Robotics. The company also specialises in safety systems for conventional robotics, from standard perimeter fencing to vision-based guard systems. This electronic and programmable perimeter guarding systems includes three video cameras mounted overhead in the work cell, which can detect when someone enters the hazard zone. This system then sends a signal to the robot to slow down or stop.